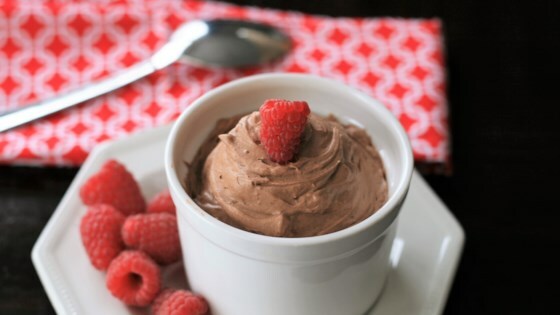 "When a sweet craving hits, you'll have this chocolate mousse ready in no time. No need to pre-whip the heavy cream - just throw everything into a bowl and mix! Use any keto-friendly granular sweetener that measures like sugar. I prefer the powdered version of Swerve®, since it dissolves better. Adjust cocoa powder and sweetener amounts to suit your tastes. This is quite rich, so you don't need a lot to feel satisfied." Place cream cheese in a large bowl and beat using an electric mixer until light and fluffy. Turn mixer to low speed and slowly add heavy cream and vanilla extract. Add sweetener, cocoa powder and salt, mixing until well incorporated. Turn mixer to high, and mix until light and fluffy, 1 to 2 minutes more. Serve immediately, or refrigerate for later. See how to prepare the perfect topper to a romantic dinner. You can pulse granular sweetener in a blender or food processor to achieve a powdered consistency. Use different flavored extracts for variety. Perfect without adjustments, and VERY filling! really good, really easy, added #reddiwip with raspberries. I looked at nutrition after I ate it. Yes, low carb but a little too high in fat. will make again though!